Categories: Bar and Bat Mitzva Gifts, For Parents and Grandparents, Gifts for Community Leaders, Gifts for the Jewish Home, Great Gifts for the Holidays!, Jewish Children's Gifts. 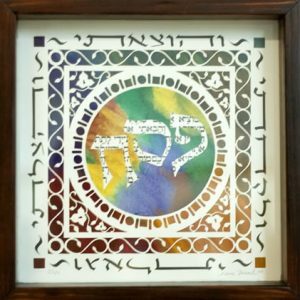 Tags: Beit Hamikdash, Blessing of the Children, Hebrew Prayer Art, Holy Temple, Jewish gift, Judaica, Marci Wiesel, Papercut Blessing, Priestly Blessing. 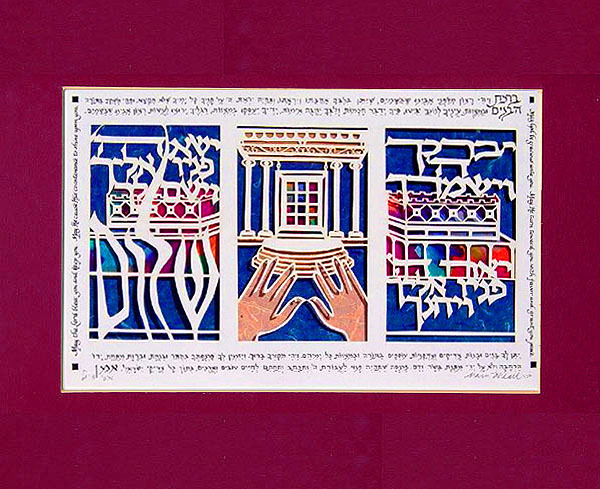 The three panels that appear in the Blessing of the Children / Priestly Blessing papercut comprise a representation of the Holy Temple, the Beit Hamikdash, with the priestly hands positioned in the center together with the Hoshen Mishpat (Breastplate of the Law). It is said that every Cohen is endowed with the innate capability to hold his fingers in just such a way when blessing the nation of Israel. The breastplate was worn by the High Priest during the time of the Temple. 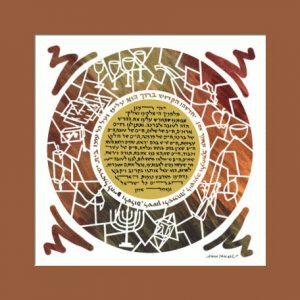 Every one of the twelve tribes of Israel was represented on the Choshen with their own unique precious stone. The most meaningful word in the verse is also the last word, Shalom, Peace. 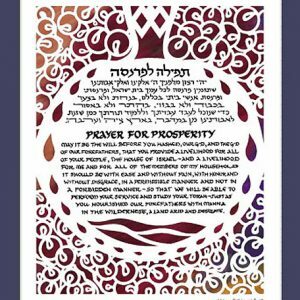 The Priestly Blessing, said every Shabbat evening, states: May G-d make you like Ephraim and Menashe (for girls: like Sarah, Rebecca, Rachel and Leah). May G-d bless you and keep you. May G-d shine his countenance on you and be gracious to you. May G-d look kindly on you and give you peace. Continuation of the blessing for Yom Kippur: May it be the will of our Father in Heaven, that He instill in your heart His love and reverence. May the fear of”G-d be upon your face all your days, in order that you not sin. May your craving be for the Torah and the commandments. May your eyes gaze toward truth; may your mouth speak wisdom, may your heart meditate with awe; may your hand engage in the commandments; may your feet run to do the will of your Father in heaven. May He grant you righteous sons and daughters who engage in the Torah and the commandments all their days. May the source of your posterity be blessed. May He arrange your livelihood for you in a permissible way, with contentment and with relief, from beneath His generous hand, and not through the gifts of flesh and blood; a livelihood that will free you to serve Hashem. And may you be inscribed and sealed for a good, long life, among all the righteous of Israel. 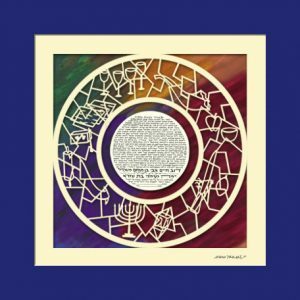 This beautiful Judaica papercut by Marci Wiesel, makes a makes a loving Jewish gift for any Jew.